The phenomenon of desperate refugees risking their lives to reach safety is not new. For hundreds of years, people have left behind family, friends, and all they know in hope of a better life. 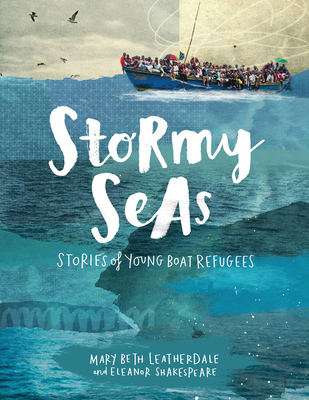 This book presents five true stories about young people who lived through the harrowing experience of setting sail in search of asylum: Ruth and her family board the St. Louis to escape Nazism; Phu sets out alone from war-torn Vietnam; Jos tries to reach the U.S. from Cuba; Najeeba flees Afghanistan and the Taliban; Mohamed, an orphan, runs from his village on the Ivory Coast. Aimed at middle grade students, Stormy Seas combines a contemporary collage-based design, sidebars, fact boxes, timeline and further reading to produce a book that is ideal for both reading and research. Readers will gain new insights into a situation that has constantly been making the headlines. Mary Beth Leatherdale writes, edits and consults on books, magazines, and digital resources for children and youth. Eleanor Shakespeare is an illustrator and designer specializing in collage and photomontage image making. She works across publishing, editorial and design, and is the artist-in-residence at a high school in South London.